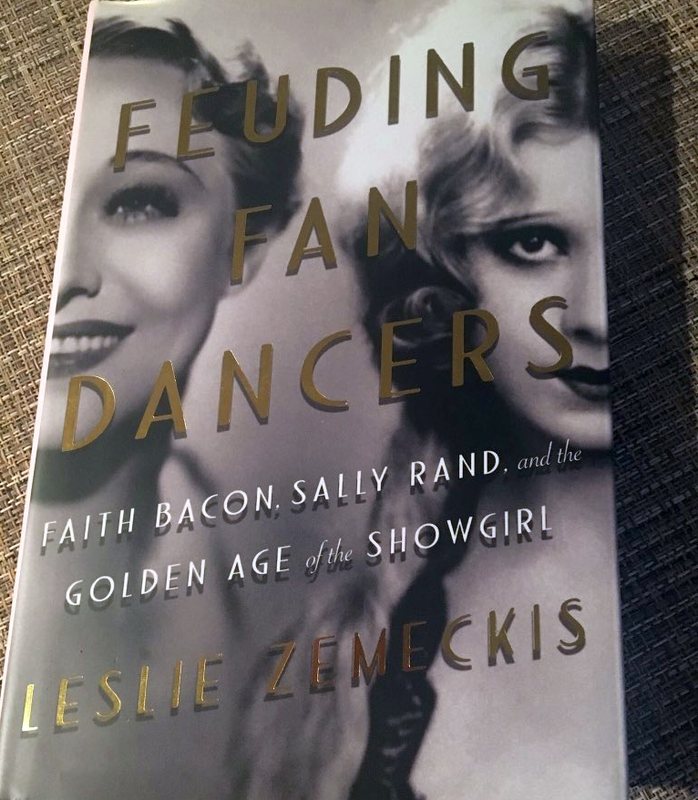 Feuding Fan Dancers: Faith Bacon, Sally Rand, and the Golden Age of the Showgirl is the latest book from actress and author Leslie Zemeckis and it is breathtaking. One of my favorite pastimes is reading Old Hollywood biographies and autobiographies, so when I was offered a copy of Feuding Fan Dancers in exchange for telling you about the book, I jumped at the chance so fast I startled both the cat in my lap and the one on the back of my chair. Like many people who spend a great deal of their time in Classic Hollywood, I was somewhat familiar with Sally Rand. I had not heard of Faith Bacon, however. While my knowledge of Sally was limited (I knew she had danced with feathers and that she’d been in a couple of movies), at least I could put a face to the name. I couldn’t have told you who Faith Bacon was if I’d had to. Clearly I needed an education on the Golden Age of the Showgirl and Leslie Zemeckis provided it. I assure you, no other textbook could compare to this one – or even come close! Those last five words jumped off the page at me when I first opened the book, “…both women come alive again.” That’s my personal mission when it comes to Hollywood Yesterday. Few things excite me more than seeing stars from yesterday shining just as brightly as they did when they walked the earth. Through the pages of Feuding Fan Dancers, each beautiful showgirl is with us as we read about their heartbreaks and triumphs, their bold creativity and talent, and even their masterful twisting of reality (especially entertaining). When doing book reviews, I am always mindful of several things – telling the reader why he or she should read the book is, obviously, right up there, but I also put a lot of effort into not giving anything away. When an author writes a book, they unveil truth and information in a particular, well thought-out manner. They put a lot of time and effort (often years) into research and writing and I have zero intention of letting any secrets out of the jar. The author has earned that right to lift that lid. I will say that you’ll be amazed by the things life threw at these ladies as well as the things they threw back at life. Feuding Fan Dancers is an especially fascinating book and is a joy to read. It reads at a very fast-pace as each star’s life unfolds before the reader’s eyes. The two showgirls come alive on each page and they bring a lot of fascinating people with them… many of whom you have heard of. A VERY impressive amount of research went into this wonderful book. I am blown away by the facts the author was able to piece together from so long ago. As I hinted at earlier, both Sally Rand and Faith Bacon got pretty creative with their “facts.” Truth be told, they were almost as creative with reality as they were feathers. The fact that Leslie Zemeckis was able to travel back in time and sift though all of the information is truly remarkable. I love everything about the way the book is written. Each woman’s life is told separately, culminating to the point where each became… for better or worse… aware of the other. As I said, I knew of Sally Rand before reading Feuding Fan Dancers but had never heard of Faith Bacon. After reading this remarkable book, however, I’ll never forget Faith Bacon. There was something mesmerizing about her – a mixture of strength and vulnerability. While Sally often displayed even more strength – she never seemed as vulnerable as Faith Bacon, which, given the time and circumstances, is a real testament to her self will and confidence. I’ll never forget either lady and I am profoundly glad to have gotten the chance to know each better. In fact, I have grown so fond of them that I’ve already started reading the book a second time! While I often re-read my favorite biographies, I seldom begin a second time through on the very day I finish, but this was the case with Feuding Fan Dancers. Their lives turned out differently, I look forward to revisiting them a second time and seeing what circumstances and even people could have helped them reach such horrifyingly different destinations. About the Author: Leslie Zemeckis is an entertainer, author and award-winning documentarian, specializing in early American forms of entertainment (from burlesque to the circus). With an impressive burlesque collection. Zemeckis wrote/produced/directed the critically acclaimed documentary shown on Showtime “Behind the Burly Q” the true story of old-time burlesque. Her second film, “Bound by Flesh” about Daisy and Violet Hilton, sideshow “freaks” won many festival awards as both best documentary and best director and can be seen on Netflix. Her current film “Mabel, Mabel, Tiger Trainer,” is about the world’s first female tiger trainer. Her book “Goddess of Love Incarnate; the Life of Stripteuse Lili St. Cyr” is the best-selling in-depth story of the influential burlesque dancer in Hollywood in the ’30s-50s, Montreal nightclubs, and Swinging 52nd Street in New York. Zemeckis is co-staring in the film “Welcome to Marwen” opposite Steve Carell Dec 2018. 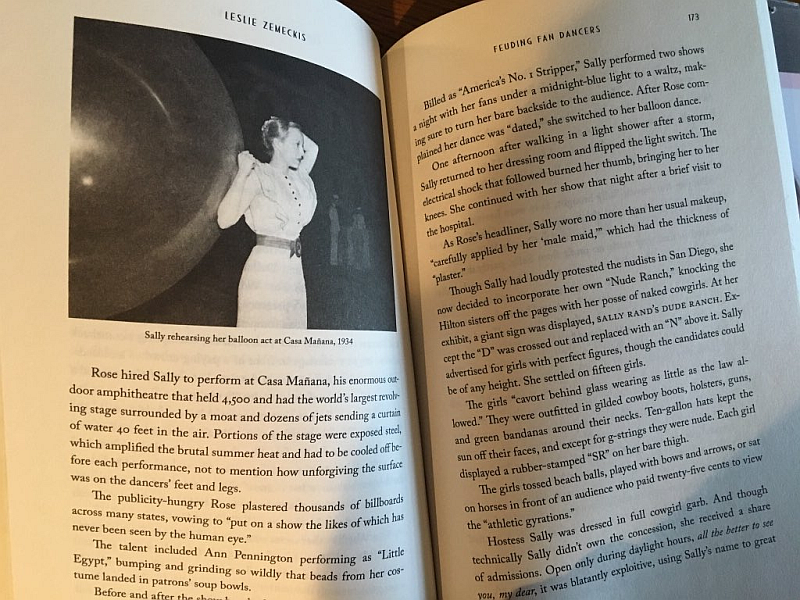 Her latest best-seller FEUDING FAN DANCERS is about Sally Rand, Faith Bacon and the golden age of the Broadway showgirl. She extensively interviewed and researched both fan dancers ground-breaking performances, the history of the American world’s fairs and early Hollywood. Find more at lesliezemeckis.com. Read more about Feuding Fan Dancers by clicking the links. You’ll find many glowing reviews – which the book and author both certainly deserve. More Classic Hollywood Book Reviews on Hollywood Yesterday.